Get your inner Richard Simmons on with our aerobic flooring! 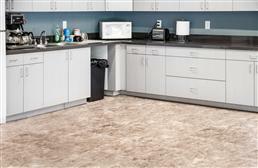 Available in foam, rubber, plastic and vinyl, our fitness flooring is perfect for both commercial and residential use. 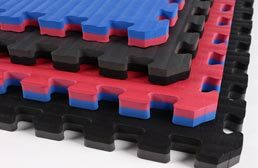 Our foam exercise flooring is great for stretching and other low impact exercises. These tiles and mats are very shock absorbent and comfortable. Our rubber workout flooring is our most versatile aerobics flooring. These tiles are very shock absorbent, great for strength training and other high impact workouts. 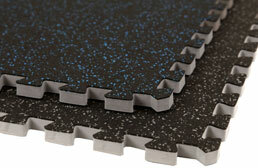 Our plastic and vinyl aerobic flooring is very durable and shock absorbent. These tiles give you the look of real wood and stone without the hassle, making them great as aerobic studio flooring. Come on people! You can do it! Who doesn’t remember Richard Simmons yelling at you through the TV. Man, those were the days! Aerobics has been around since the 60s and ever since Jane Fonda came out with her exercise videos, it has been a hit. Aerobics is a form of exercise that combines rhythmic aerobic exercise with stretching and strength training. For one to do this, you need some great music and a great floor. I like to listen to Donnie and Marie Osmond. Who doesn’t like a little bit of country and rock-n-roll! Aerobics flooring is essential for you to be able to perform at the highest level while working out. At RubberFlooringInc, we offer a wide range of aerobics flooring. 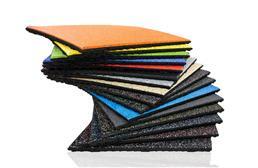 From foam tiles to rubber flooring, we are certain you’ll find the floor for you. The thicker the tile, the more shock absorbent the flooring will be. 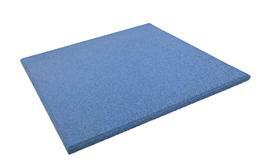 Our interlocking aerobics foam tiles are very easy to clean with the use of a broom, rag or mop. We recommend using a mild soap and water solution to clean the floor. 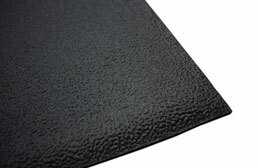 Our rubber flooring for aerobics is very shock absorbent. 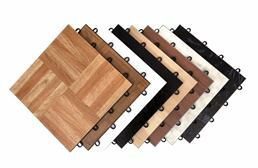 At 1” thick, these tiles are great if your workout space is in an upstairs room, apartment or condo. They will allow you to drop weights with no regrets. Now your neighbors won’t have to hear you goin’ all out with Richard Simmons! These tiles are very easy to install with the use of dowels, which are little pegs that connect each tile together. 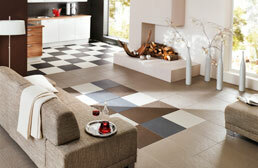 Since these tiles are not interlocking, they are great over any thickness of carpet. So if you have a really nice thick, plush wool carpet, your exercise floor won’t separate. 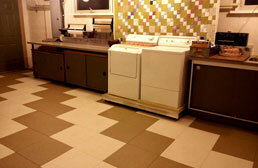 Our rubber tiles are very easy to clean with a broom, vacuum or mop. We recommend a synthetic mop head and a mild soap and water solution. 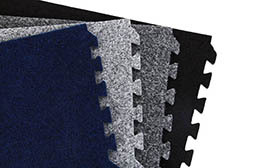 Our Aerobic mats are foam mats that are both comfortable and shock absorbent. 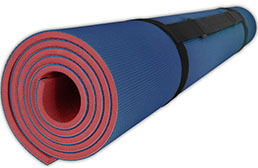 These fitness mats are a great option for floor exercises common in most aerobic classes. 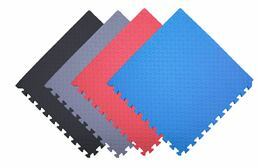 Not only are these work out mats great for standard aerobics, but they are also great for aerobic gymnastics. Our Home Cheer Mats would be the best mat for that. 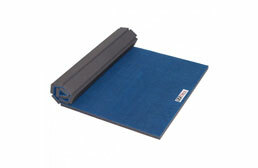 Aerobic mats are great for anyone who only wants a temporary floor for when they workout. 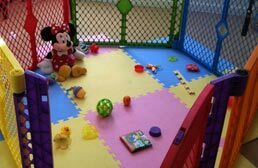 Our fitness mats can easily be moved and stored after each session. Since all or mats are non porous, they are easy to clean after working up all that sweat. Just use a rag and wipe them down with a mild soap or water solution or sanitizer. 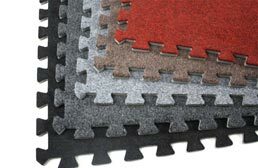 For our carpet top mats, a vacuum can be used to clean up any dirt. At most gym studios, they use wood flooring. Wood is a great floor for these spaces because it is very durable and can handle the abuse of many people pounding their feet on it day in and day out. Unfortunately, over time it starts to show its wear. And nobody wants to work out on a floor that is failing. Wood is a harder surface to work out on, which can be hard on your joints, and no one wants to ice their knees for days after a nice aerobic workout. Vinyl flooring for aerobic studios is a great alternative to wood because it is shock absorbent, comfortable and durable. Our vinyl flooring is available in tiles that can be easily installed in a weekend, which saves time and money versus installing wood. And if a tile were to become damaged, all you have to do is replace that one tile, not the whole floor. These exercise floor tiles are very easy to clean and maintain with the use of a broom and mop.